Is communication within your company a daily challenge? Is overhead paging too disruptive and not efficient? Are urgent calls going unanswered? The Star Pager, or Service Pager, from LRS provide a solution to instant communication between staff, regardless of where they are in the building. 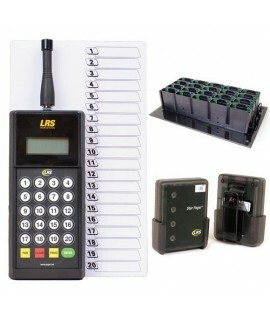 Easily reprogram pager numbers to reduce service fees. Programmable alert modes from the transmitter (beep, vibrate, etc.). Battery life: up to 72 hours on a single charge. No exposed screws - prevents tampering. 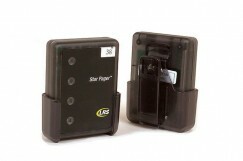 The Star Pager from LRS is the only on-site pager to feature wireless programmability. 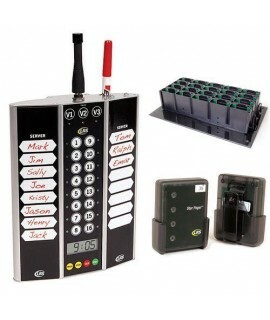 This enables the user to easily change the number of any pager from the transmitter at their location. This feature is ideal for servers in restaurants eliminating the need for grease pencils and white boards. 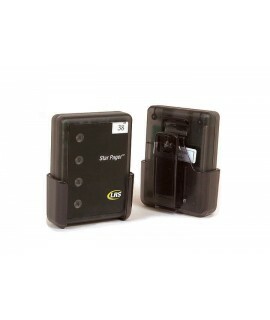 It is also the only rechargeable pager that utilizes a pager cradle instead of an attached belt clip. The pager cradle minimizes breakage limiting service costs and repair fees.The LRS service pager has the strongest vibration in the industry making it the workhorse of many industries including restaurants, nurseries, salons, and retail. In addition to its vibration alert, the LRS service pager has 4 messaging LED lights that will enhance overall communication. Vibration, beep, or vibe/beep alert modes. Cradle holder prevents broken pager clips. Nickel metal hydride batteries (no battery memory). Overall size: 3" x 2.25" .